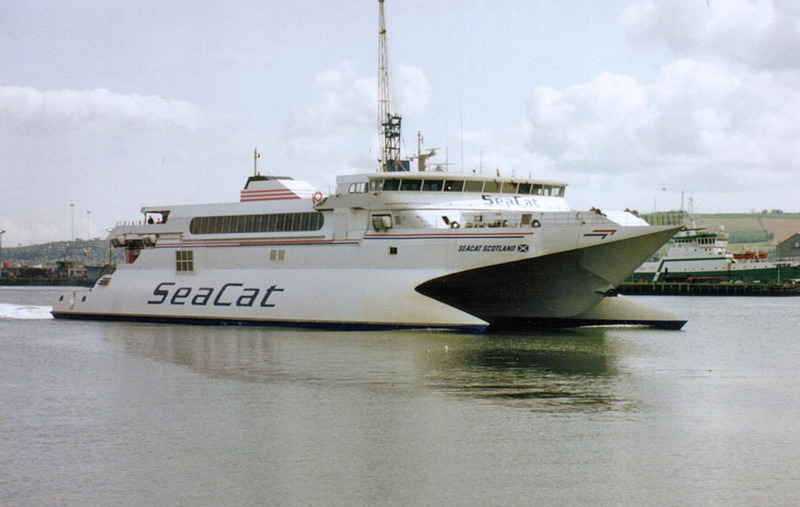 March 1992: Delivered to Hoverspeed Ltd, Nassau, Bahamas. March 4th 1992: Left her builders for Europe via Singapore – Colombo – Suez Canal. March 30th 1992: Arrived in Cowes. 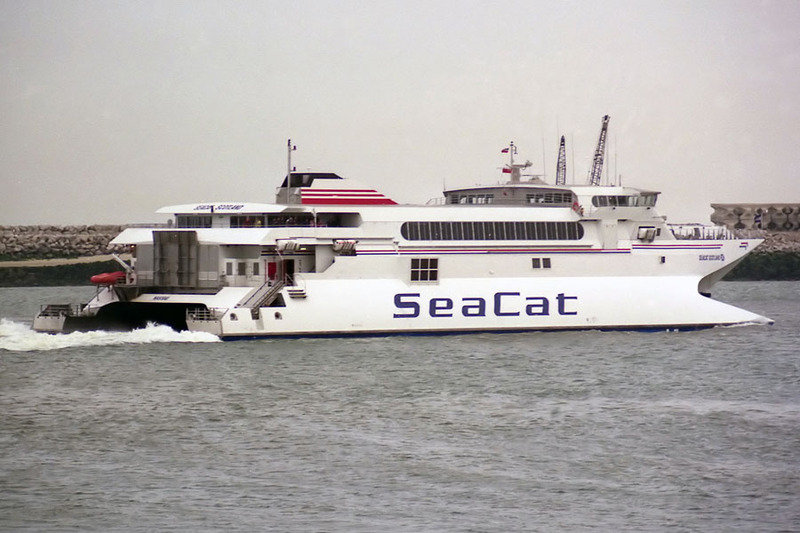 April 8th 1992: Commenced service between Dover – Calais. 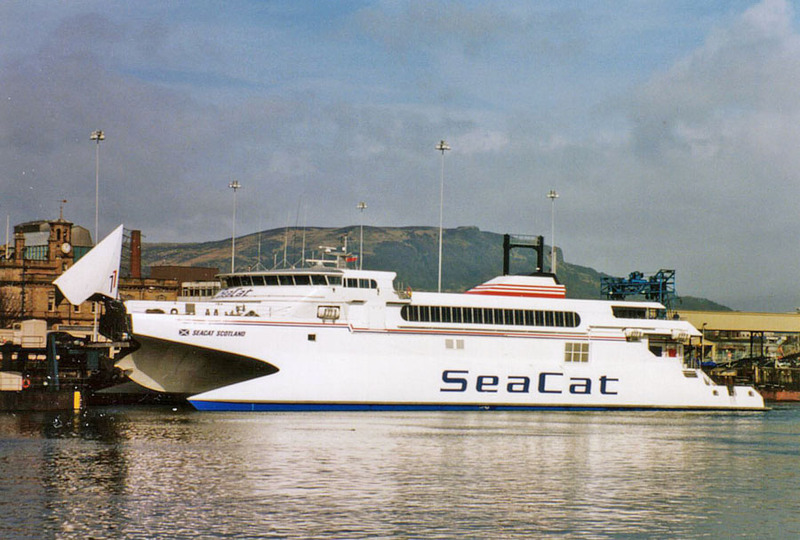 June 1st 1992: Commenced service between Stranraer – Belfast. 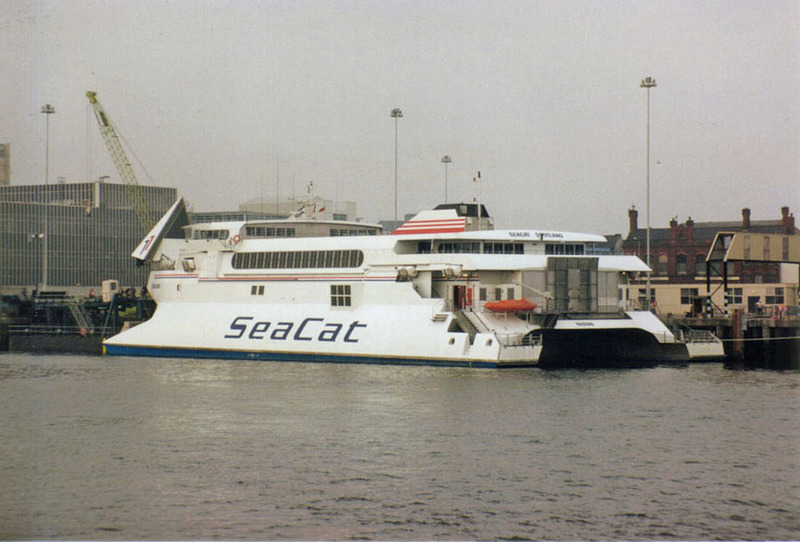 September 28th 1994: Replaced by SEACAT ISLE OF MAN. October 1994: Chartered for two years to Q-Ships, Qatar. 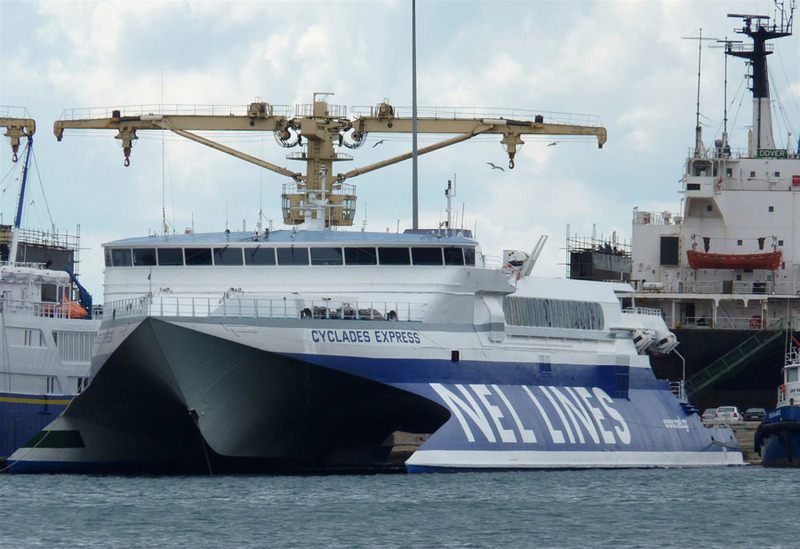 Renamed Q SHIP EXPRESS. November 1994: Commenced service between Doha – Dubai. March 18th 1995: Commenced service between Stranraer – Belfast. 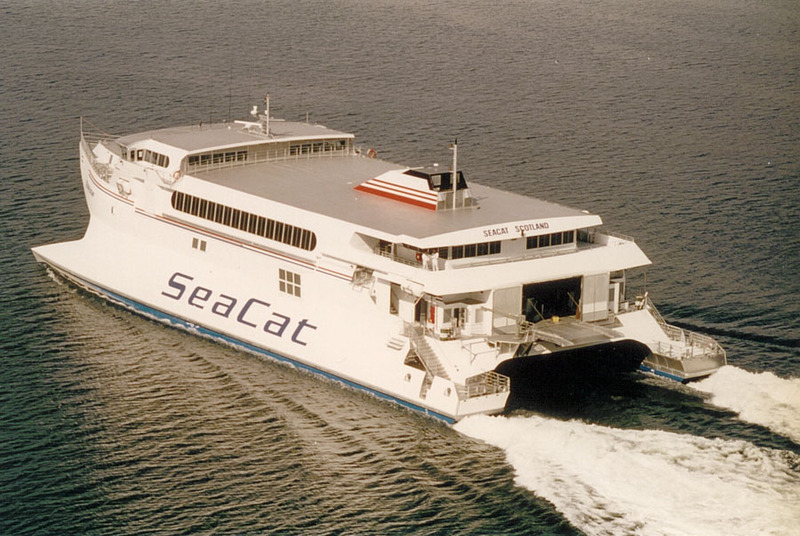 Renamed SEACAT SCOTLAND. 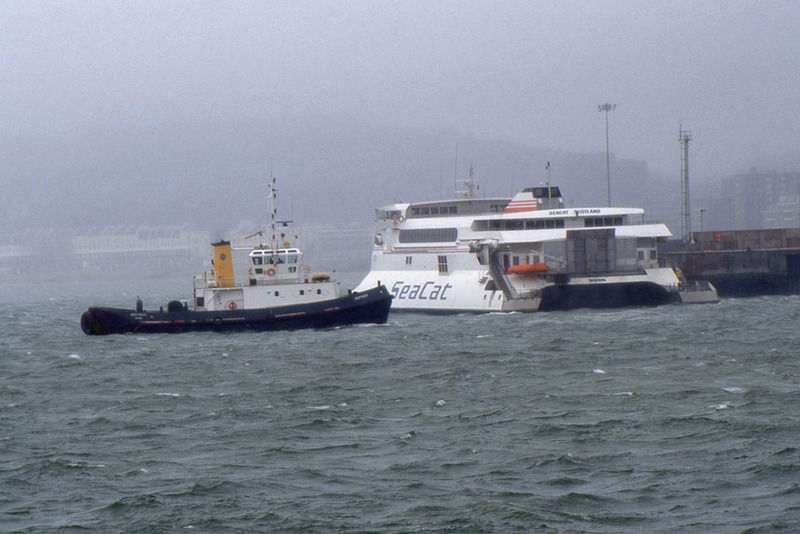 February 1997: Home port as Stranraer. August 31st 1997: Laid up in Liverpool. 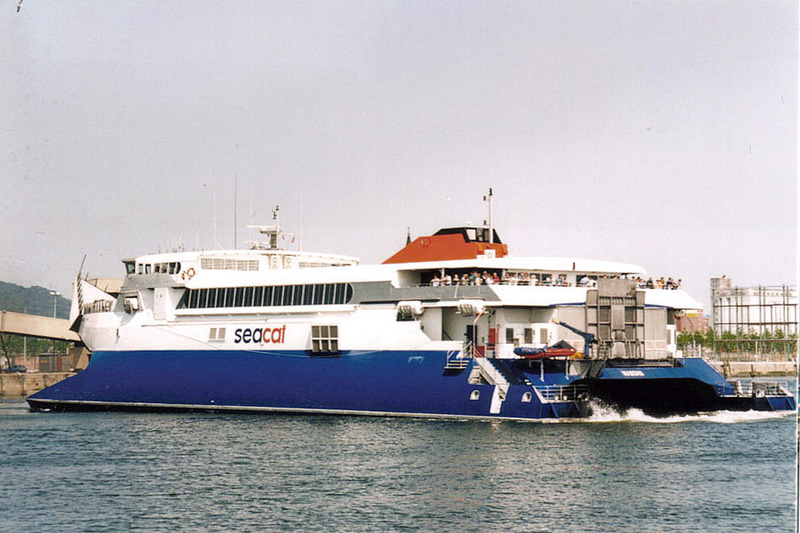 September 1997 – April 1998: Chartered to Navegacion Atlantida SA, Colonia, Uruguay. Commenced service between Colonia – Buenos Aires. 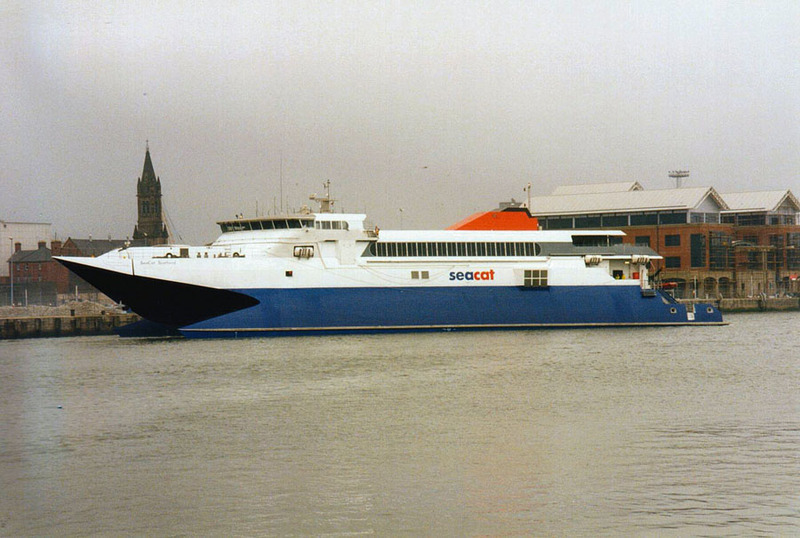 April 29th 1999: Commenced Belfast – Stranraer/ Troon. 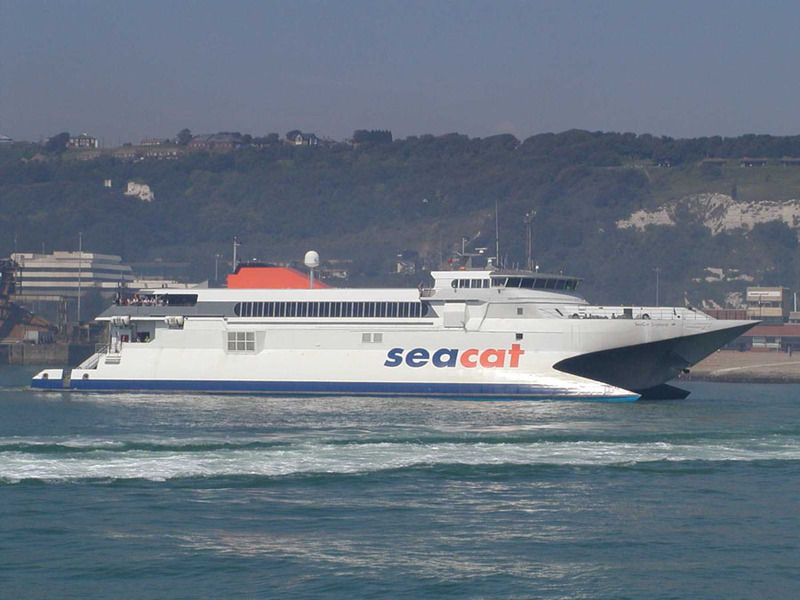 April 2003: Commenced service between Dover – Calais. September 25th 2004: Left Dover for Sunderland and yard lay up. March 8th 2007: Announced Fortune Maritime of Greece will operate her as the SHIKRA in the Eastern Mediterranean. September 20th 2004: Laid up at Pallion Yard, Sunderland. 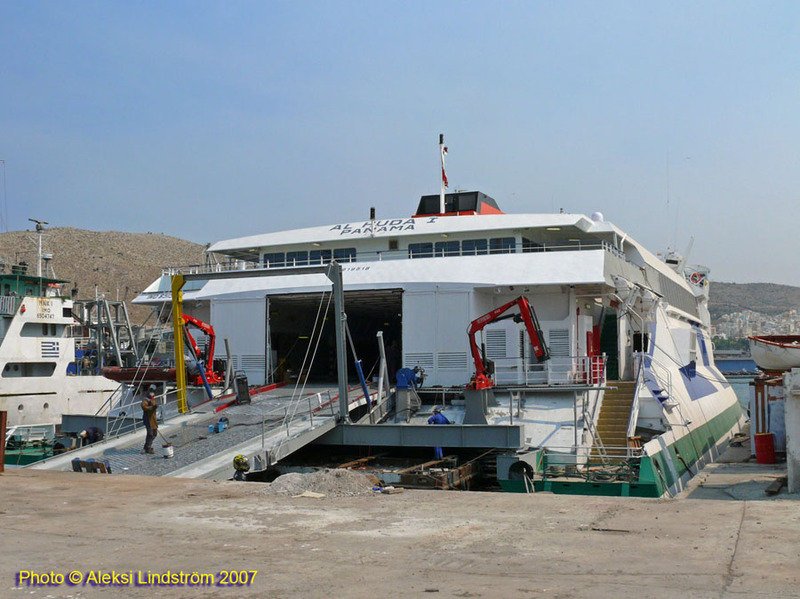 March 2007: Sold to Fortune Maritime, Greece. April 26th 2007: Renamed SHIKRA. Taken over by her new owners (Registered to Percival Co, Panama). 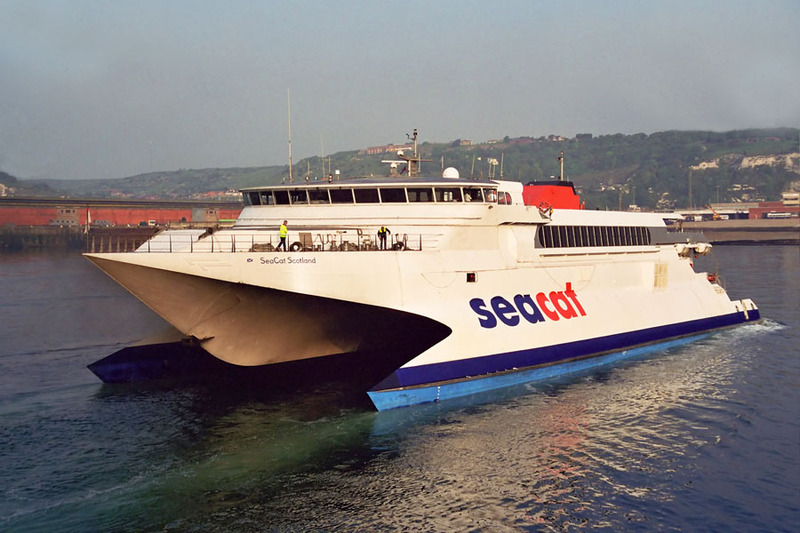 April 26th 2007: Left Sunderland via Algeciras for Keratsini, Greece. 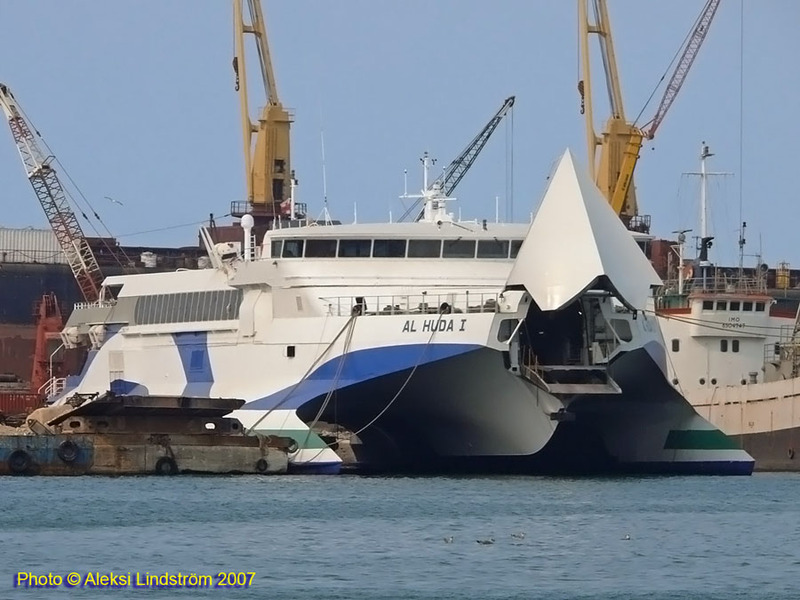 May 2007: Renamed AL HUDA I.
August 11th 2010 – August 31st 2010: Operated between Heraklion – Santorini. September 1st 2010: Left Heraklion for Keratsini. September 2nd 2010: Arrived Keratsini laid up. December 2015: Sold to Seajets. 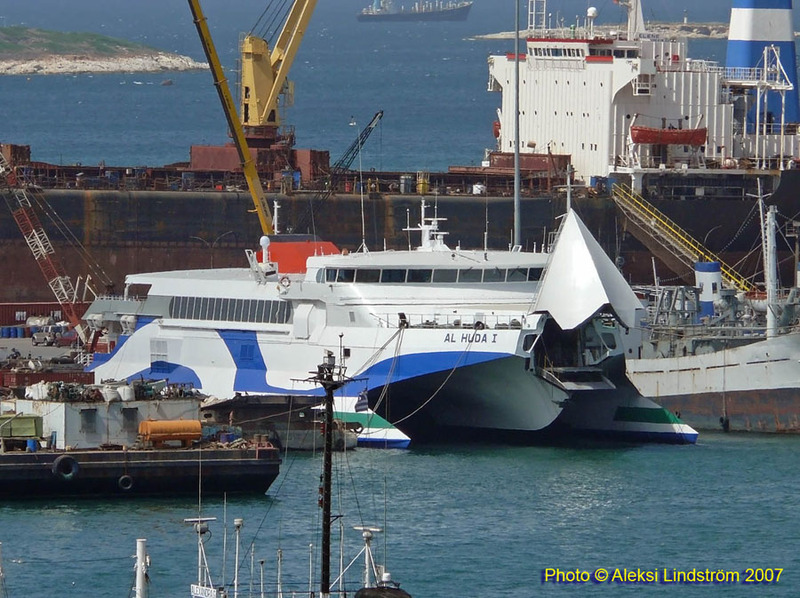 Registered Owner: Jambo Maritime Company, Piraeus, Greece. 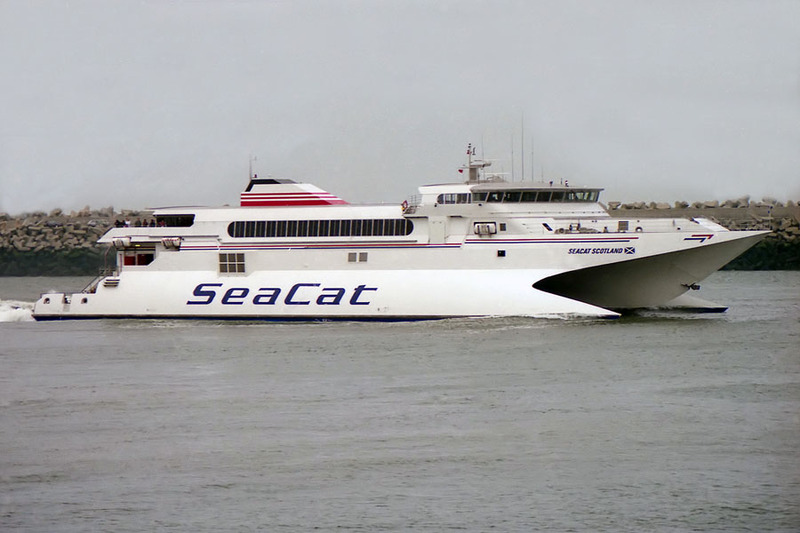 Registered Manager: Seajets Catamaran Joint, Piraeus, Greece. February 4th 2016: Arrived in Drapetsona under tow. 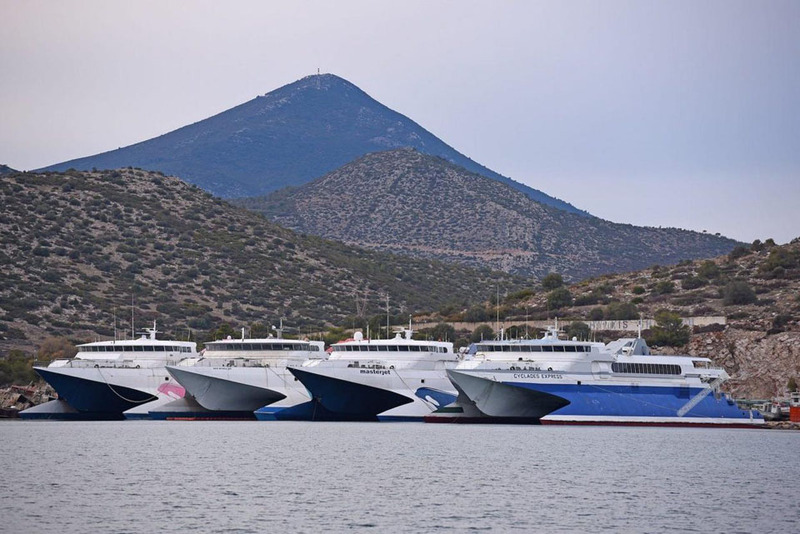 Its expected that she will be renamed the NAXOS JET. All information is believed to be correct and no responsibility is accepted for any errors or omissions found. All items included in this article are subject to © copyright. We would like to take this opportunity of thanking: Aubrey Dale, Aleksi Lindström, Ken Larwood, Justin Merrigan, Bob Smith, Sebastiaan Toufekoulas and Andreas Wörteler for their assistance in producing this feature.